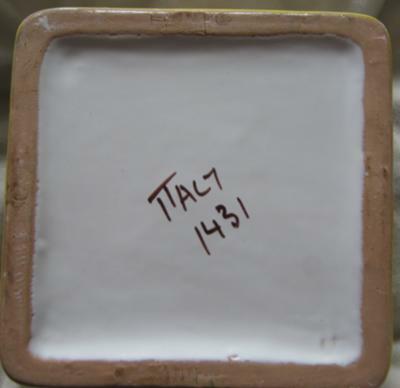 Pottery Mark Query - "Italy 1431"
Pottery Mark Query - "Italy 1431":- Hi, I have recently inherited some pottery after my mother passed away. 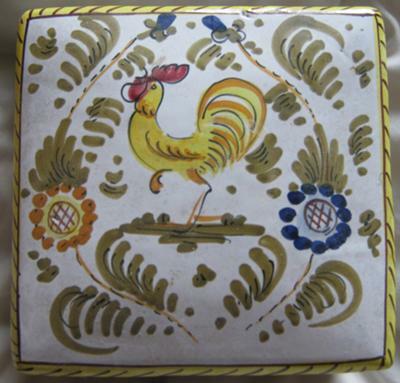 Some of the items are clearly marked from Staffordshire potteries, but 1 or 2 of them are marked with a hand written "Italy" and then a number such as 1431 (this is a square lidded trinket box, decorated with a hand painted cockerel and other patterns). I am having great difficulty finding anything out about these pieces, and would be grateful for any assistance you could give. I am a complete novice to trying to identify anything, and the value is not so important to me as the heritage, but it would be nice to know!! I can remember the box in particular being in my mothers bedroom on her dressing table from my early childhood. My parents married in the 1950's and so the items could have been acquired then, or they may have been passed on from an elderly friend. I have found this site to be really helpful in the past, but there didn't seem to be anything that quite fit the stamp mark I have here, and so I do hope there is someone out there who might be able to give an insight into where these items come from, and what heritage they have. Thanks for your submission. I am glad to hear you have found this site a useful tool for research. fairly recent times (1950), and I feel it was a marketing ploy more than anything else, as they were known by other names long before this name was thought up. The firm in question Keele Street Pottery, founded 1915, buying out Paramount, Winterton Pottery, Thomas Cone, Alma Works, Collingwood Bone China, Conway Pottery, Piccadilly Pottery, and Lawton Pottery in the immediate post war period - became "Staffordshire Potteries Ltd" in 1950) is not to be confused with other longer-standing firms with the word "Staffordshire" in their title. A good example of this would be the famous "Crown Staffordshire" of the Minerva factory. So your use of the term "Staffordshire Potteries" is not quite a straightforward as it might seem. Now, about the Italy trinket box. I do not know too much about Italian wares apart from people get confused about what is a factory and what is a style. - e.g. Capodimonte is not a single firm with rights over the name - the word merely describes a general style of wares which doesn't even have to be Italian in origin. Anyway, another Italian style of wares is majolica - which is a richly coloured and decorated, low fired, often tin-glazed and style of earthenware. I have noticed on my travels in Italy that whatever town or area I visit there is are normally several ceramics 'shops' making and selling their own designs of majolica wares. These are often beautiful little outlets with a nice sense of Italian style showing very nice merchandise run by lovely local people. The wares seem to marked for the tourist rather than for identification purposes - so they are often just marked with the word 'Italy' with added numbers. Not sure if this is a traditional way of marking or not, but it is certainly different from the English or German way of marking. If someone knows more of this Italian way of pottery marking, please post below. Comments for Pottery Mark Query - "Italy 1431"
In response to Jen's question on italian trinket box mark, I have a pitcher which is in the form of a Rooster which has similar marking. Almost looks like the same person wrote it. Marking is "Made in Italy 786". I have not found anything definitive so far as to origin. I have some pottery with that exact mark Italy but it also has KBNY, usually written as KB/NY is the importer's mark and it stands for "Koscherak Brothers/ New York". They had a major showroom on Fifth Ave in Manhattan. The company had been importing fine ceramics and crystal wares since 1895. They only sold wholesale to the finest department stores and boutiques in the country such as B. Altmans, Bloomgdale's and Macy's. They imported a large amount of the ceramic output of Ugo Zaccagnini. I have seen this same mark without the KBNY mark as some of the items that imported in did not have that mark! Hope this helps, Check online under the brothers name and you will come up with more info! Steve, you are a star. Thanks for solving this mystery mark not only for the posters here, but also for the hundreds of people who will Google (or Bing) this in the future! HI. That there written looks like a Bitossi signature. My pattern matches this picture. I got mine from my grandmother who inherited it from Italy, not some American department store!! I am not sure how to spell the name, but it means singing rooster. It can be quite valuable if is an older piece. Thank you for the information Steve, but I am in the UK, my parents never travelled to the USA, and did not have any friends of family there so the chances of something coming from New York to the midlands are pretty low I think! I think the Orvieto rooster patterns made by Deruta are a more comparable design, and this is possibly a copy made by another Italian ceramic manufacturer ... I am under no illusion as to it being worth much, the fact that it was my mum's means more to me than anything else. Thank you for all the comments though - it is great to have found out so much information. I have photos but don't know how to upload. Contact me @ [email protected] & I'll forward for you to loo at. I live in Alberta, Canada. No idea how this item made it into my parents stuff. Thanks for all the contributions so far. Piecing together all the info so far, there are obviously a few Italian 'majolica' companies such as Deruta and possibly Zaccagnini exporting to markets such as the USA and UK via distributors. Like the local firms, these Italian makers seem to have the tradition of marking their wares by hand rather than by print or stamp. I googled Ken's M&C mark associated with Deruta and found this plate with M&C seeming to be the initials of 'Manolo e Claudia' who are something to do with Deruta. So the M&C or 'Manolo e Claudia', seem to be none other than the painters at Deruta. If the handwriting and mark is the same, then presumably the mark is Deruta. The style certainly would be a fit. The 'singing rooster' pattern translates as 'Canto Gallo' and this appears to be a popular theme amongst different makers selling this type of ware. Be sure to mark it with the thread description "Pottery Mark Query - "Italy 1431"
Could you please help me too? . I got a Large Antique porcelain ship with light, named,"ORION" H60cm x L50cm x W30cm with Phoenix emblem on glass/ceramics sail. I have just found a beautiful little Italian vase with what is I believe the same Italy mark, but it is numbered 5010/81 and has the initials M. & C. (I think). The middle "&" could also be an "R", it is hard to read. Also, and I think strangely, the vase has a winter scene on it. I have no idea if it is old or new. Does anyone have any suggestions on this one? What I have found about that particular mark from a piece I had is it was massed produced strictly for export. I am not sure if other marks on it means where it was made such as the number I cannot find any reference to a number. I have some kitchen jars (3) with the same Italy 'signature' and a series number after. Have you got any closer on the origin? Mine is very similar to the one originally described above, however mine says '25/7 . DM' then beneath is the familiar 'Italy' from the very first post. I am wondering if DM is an artist or just the manufacturer. If anyone knows anything I would appreciate it! I have a bowl many colors that say B 1029 Italy does it have any value. I have a small pitcher and bowl that say 1656 Italy on the bowl and 1535/103 Italy on the pitcher. Beautiful colors on both. I have a set of multi color flowered small plates with similar markings from my grandparents who traveled extensively to Spain, Portugal and Italy. The markings on back are Italy 461 and a sideways "H". There is also some cutout triangular shapes on rim. Does anyone know if they are safe to use as dishes or would they contain lead? I have to believe they are from around the 1950's. Thank you for any help identifying them. I have a sugar and cream set with the same Italy 231 marking on them. A cousin of my mother brought them back from Italy in 1958, so I know they came directly from Italy. I use this set every Christmas since the main color is green. I have not poisoned anyone with the creamer, but I do not know if you can put hot food on them. Hope this helps. Thank you ERM and happy to find out that there have not been any poisonings using these. I have a plate marked "Italy 1532 " and tried to find information on it with little success until I went to my Mom’s and saw a similar plate with the exact same markings on her’s. I’ve come to the conclusion, and this is strictly my opinion, that this is a souvenir piece and the markings are not a numbered piece but perhaps identify the area it came from. I too have inherited items with Italy pottery mark and numbers. Two burnt orangish colored candlesticks with cherub marked 1842 ITALY with a mark V inside a circle. Store stickers from Ovington's NY are still attached. A matching fruit bowl is marked 1824 ITALY followed by a mark ACA. My understanding is these were purchased by my grandparents shortly after they were married in 1932 while on a trip to NYC from their home in upstate NY. With so much information available online now I hoped to find out more about these items. Thanks for the information on your site! That would be the Scafatti family that had the showroom. I have a Merlin figurine that I can not identify The Scaffati's are my imediate family, but the older oes have passed. Anywhere I can upload a pic to show what I have?